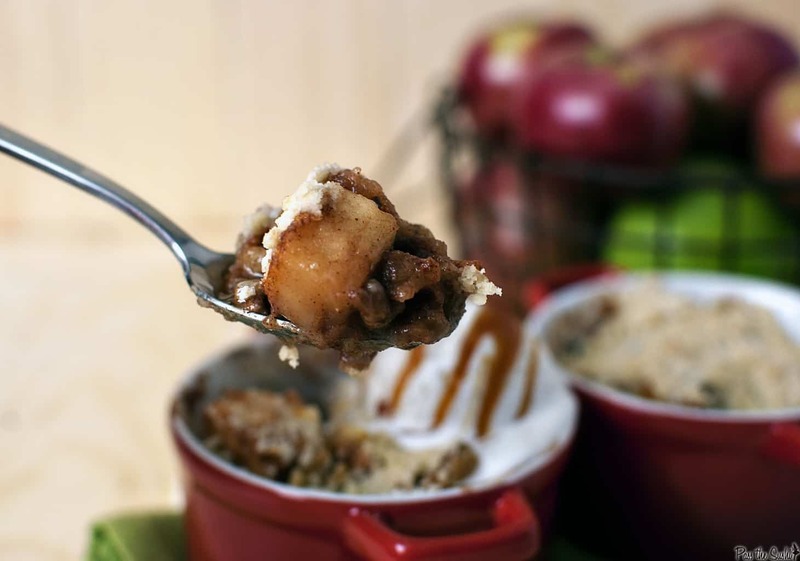 Apple cinnamon crumble is the perfect fall dessert! 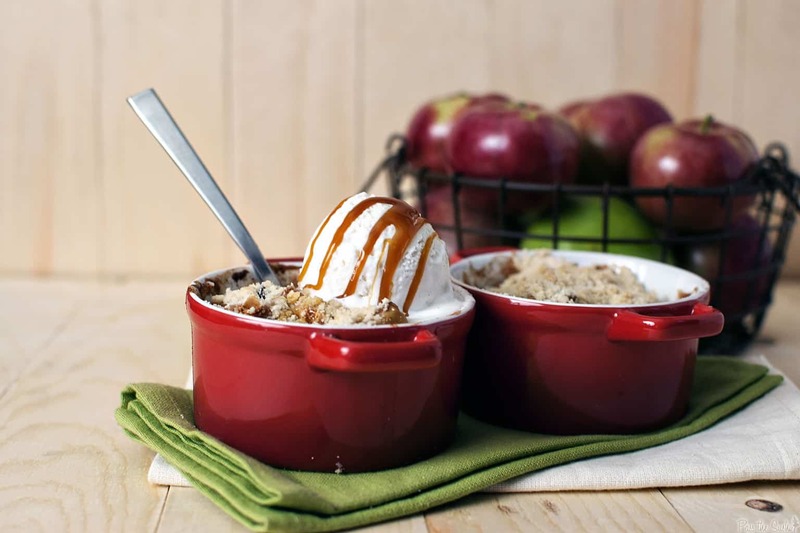 Juicy apples, warm spices, and a crumble topping, with a scoop of vanilla ice cream and caramel to sweeten the pot. It’s that time again! I have made it to my second month of active participation in a ‘club’. 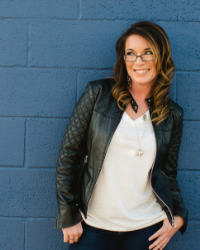 It’s called the Secret Recipe Club, where you are assigned a secret mission to be a ninja all over someone else’s blog, get to know them, check things out and pick a recipe and let it shine to the world. (Seriously, I would join any club where I got to be a secret ninja). This month I was given Searching for Spice, Corina’s blog about trying new recipes. The site has tons of very diverse recipes, some even inspired by Top Chef challenges. How cool is that? I would never have the guts to tackle a lot of the challenges on Top Chef. 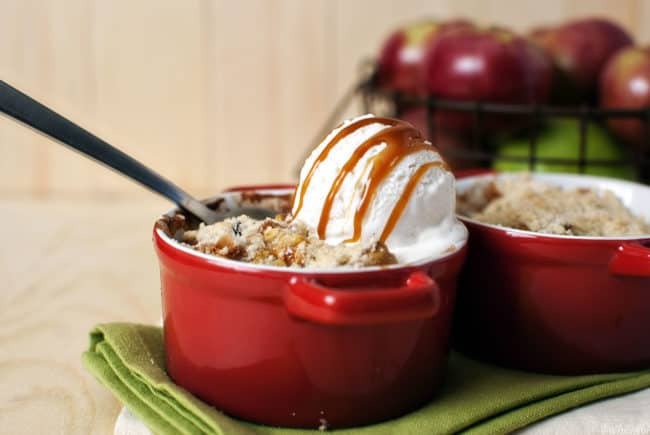 Since I’ve been all into Fall recipes, scents, apples and socks I chose to highlight this apple cinnamon crumble. Peel, core, and dice the apples into 1/3 to 1/2 inch pieces. Put them a saucepan with the water. Sprinkle with the cinnamon, stir in to coat the apples. Mix in the raisins and walnuts. Cook for about 10 minutes, stirring occasionally. (You’re going for fork tender apples here). Make the crumble topping by rubbing the butter, flour, and brown sugar with a dough blender or fork. When it has reached a sand like constancy you’re good. Put the apples into a small ovenproof dish or individual ramekins. Cover heavily with the crumble mixture and bake in the oven for 20 minutes or until golden and bubbly. Let cool before handing this to small children – hate to have a molten apple incident. Serve warm with custard or ice-cream and freshly grated nutmeg on top. I so wanted to participate but I didn’t have the time! 🙁 This recipe looks great and esp for fall! This looks amazing. I could probably eat seconds and thirds of this! I love this time of year with all the apple and pumpkin recipes! This looks wonderful and I can almost taste the soft apples with the hint of cinnamon. Yum! This crumble looks amazing! What a terrific fall dessert to entertain with. Oh yum! This looks so good – I can’t wait to get a hold of a bunch of apples and get to baking things like this! Thanks for letting us in on the secret here – hello, fall! Your presentation is gorgeous! I love Apple desserts! This apple crumble looks perfect! And no better way to serve than with a scoop of vanilla ice cream! Your crisp looks fantastic! Great SRC recipe choice. Definitely checking out that blog. That sounds so easy and looks fantastic! Kita, those crumbles look SO delicious. I have been craving apple dishes ever since September started. Great SRC post!! Wow that crumble looks to die for! I am so glad you made it. So perfect for the fall season. I just went to an orchard this past weekend and got a TON of apples. I will be making this soon! Im trying to convince Handsome to go apple picking soon! I love the way you’ve presented this and it looks great with the ice-cream you’ve served on top of it. I’m going to have to make it again! That forkfull is so dark and cinnamony-this must be really packed with spices-Yum! Great pick from a spicy blog, especially due to the fall weather. Well done. What a perfect recipe to choose!! This looks so good and you cannot go wrong with apple and cinnamon!! This crumble is perfection, Kita!! You picked a good one!! My fave!! I love crumble. I’m usually a pumpkin addict during the fall but so far this year I’ve been loving apples! This crumble looks like a great way to use up my huge back of apples I recently picked at an apple orchard. Apples are one of my favorite desserts, top them off with ice cream…I’m swooning! I’ve been dying to make some apple crips/crumble. This looks outstanding. Great SRC post! Yum, yum and yum. I love apple crumbles. Can’t wait to try this one! In the fall there’s nothing better than an apple crumble! Especially after going apple picking! Beautiful photos! I love that you drizzled some caramel over the ice cream. What a simply divine dessert and easy to make, even better. Great photos and a wonderful SRC post. Have a wonderful week!!! You picked a great recipe for SRC. It is that time of year for apples and pumpkins. This screams comfort. You got a great SRC blogg also. Thanks for sharing with us. mmm this is one of the best treats for fall! I love the scoop of ice cream on top too… so very appetizing! Great pics, as per usual. And wow! You and apples really get along. This looks delicious! those are so beautiful photos!! Love them! I bet that Apple crumble is wonderful! Glad to be in Group C with you! These look so comforting and delicious,the individual serving pots are so cute too! This looks fabulous! Love your little red dishes! Apple crumble is one of my all-time favourite desserts! How did I miss this fabulous dessert???? 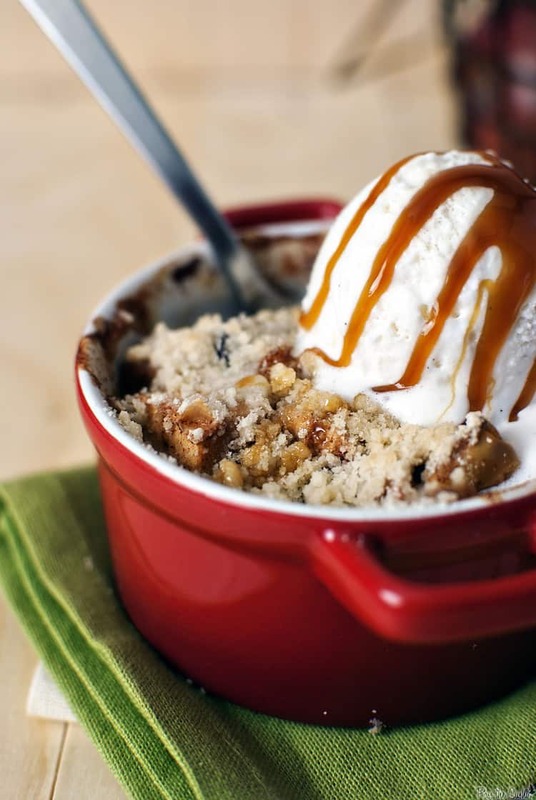 I love apple desserts…and with ice cream and caramel just pushes this one over the top!!! YUM! Kita, this is uhhhh-uhhh-uhhhhhMAZING! Love how it can be vegan since butter can be substituted with vegan butter…and plus no eggs or other dairy. Thanks for sharing, Kita! You are fab! Oh man those look absolutely AMAZING! And I have to say I love, love, LOVE all of your dishware! Is there a particular store you like to purchase them from? Every single picture on your site I drool over the dishware ALMOST as much as the food. I wish I could tell you where I’ve gotten most of my plates but a lot of them just have accumulated over the years. It looks like the Mad Hatter is throwing a 24/7 tea party at my house. However, I can say I have snagged a lot recently at TJ Maxx/Marshals/Home Goods. They are great to walk around and see what you can find on clearance! I meant to try this when I first saw it, finally got around to it. I added a slug of brandy to the apples & used dried blueberries instead of raisins (neither Jean nor I are a big fan of raisins). It was delicious & fast. This recipe will stay in my collection. I just need to get better with making crumble. I like it with some variation, coarse sand up to small gravel sized chunks, but can never manage it. Thank you so much for letting me know that you tried this one. It means a great deal to me when someone actually tried a recipe I’ve posted. I love the idea of using blueberries instead of raisins (I like them more anyway!). Crumble is tricky for me too and I always tend to over do it a bit.